The 2018 Asia Trail Master Championship series continues in Philippines for the next two weekends. First the Rizal Mountain Run in the mountains east of Manila, and second the Pilipinas Akyathlon in the Cordillera region. Two crispy points races that offer the local pinoy runners, especially, an excellent opportunity to put themselves in the spotlights early in the season. The 3rd edition of the Rizal Mountain Run, organised and directed by experienced trail runners Dean Lim and Majo Liao, takes place this Sunday with start and finish in Basekamp, San Mateo, and is a bit of an underestimated race. The 50k course - the one that matters for ATM championship points - has over 3000m of elevation and that requires an effort. Four athletes have shaped the race in the last two years by occupying the podium on both occasions. Kristian Joergensen won the inaugural race in 2016 and came second behind Manolito Divina last year, while Diorella Cerujano achieved the same but the other way around: 2nd in 2016 behind Cheryl Bihag, victory last season. In fact, Bihag took bronze last year as well, and in the men’s Mark ‘Koi’ Grey fought great battles with Joergensen in both editions to score second and third place respectively. Joergensen and Cerujano return to Rizal this weekend so it’s fair to say that anyone who wants to win this race will need to get passed them. There is competition for them, though. Danish-born Joergensen is expected to be at the top of his game as he has been preparing for an extreme ultra in Hong Kong next month, and that may be needed to repeat his triumph of 2016. On the start list we find top runners such as Pablo Diago Gonzales and John Ray Onifa. Diago Gonzales was fourth in the 2017 ATM championship and has scored 4 career race wins in the ATM series so far. Most notably in the Philippines, the Singapore-based Spaniard was the best on Mount Apo last season. Diago Gonzales likes the 50 to 70K distance, yet in the last direct confrontation he finished behind Joergensen at CM50 Ultra last November… The big question for many trail insiders is whether the two European expats are a match for hot Filippino rookie John Ray Onifa. Onifa raised many people’s eyebrows at UT Mapawa last October when he ran away from Manolito Divina and gave him nearly half an hour at the finish of a 50K race! Onifa is a young talent who comes from the road but has developed a taste for trail. Coming from a modest background, it is great to see him return to the ATM scene so early in the new season and it will be interesting to see if he could repeat that exhillirating Mapawa performance at Rizal this Sunday. While these three are expected to challenge for the podium spots, it is a new season so there’s always the possibility for new names, new faces. 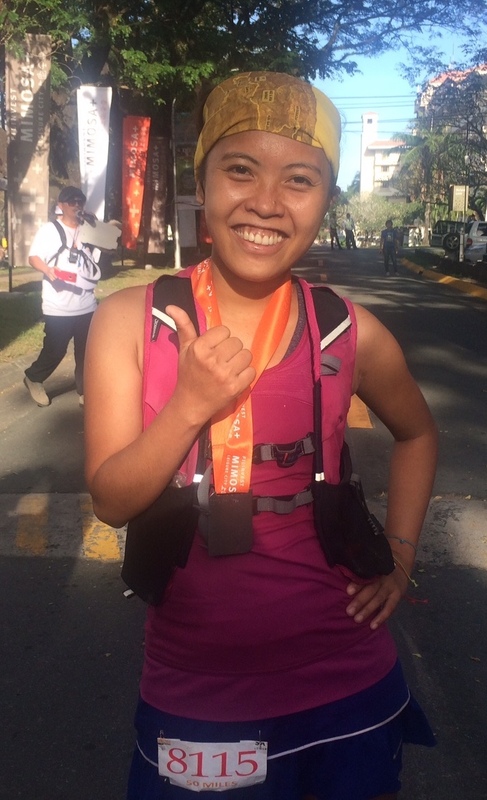 The same goes for the women’s race, where Cerujano is expected to compete with her compatriot Melanie Hingpit - third at CM50 Ultra recently - and Grandmaster Ina Budiyarni from Indonesia, the latter having seemingly recovered from quite a bad fall on her hip halfway through Tahura Trail last week. Budiyarni brings a lot of trail experience to this event compared to the others, will that be sufficient for her to claim the win on this technical course? In conclusion it is worthwhile mentioning that local hero Manolito Divina has opted to function as as an official this weekend rather than run the race. The 2016 ATM champion feels not recovered enough from his unpleasant DNF due to bad stomach cramps at UT Panoramic early December. Divina is on the start list of Pilipinas Akyathlon next week, though. John Ray Onifa: can he repeat what he accomplished at UT Mapawa last season?